Is there a light on, behind what we know? This research uses stories in various forms to understand human experience and behaviour. Stories are used both as a way of accessing and making sense of critical aspects of experience and as a way of sharing the understandings that ensue with others. Through a range of arts-based, performative and narrative approaches, the research explores personal meaning and subjectivities across diverse sport and physical activity contexts. By doing so, David asks some questions of the place and value of human and social science research in the 21st century. These questions centre on a traditional belief that generating new knowledge about the world is an adequate and sufficient goal. In recent years, the faith that more knowledge results in the world becoming a better place has been laid open to considerable doubt. The Canadian medical sociologist Arthur Frank is one prominent scholar who has suggested that new facts and theories only intensify the dilemma of what to do with what we know. At this point in history, he suggests “more knowledge may be less important than a clearer sense of value” (Frank, 2000, p. 363). The title of the lecture borrows from a song lyric by Dr Kitrina Douglas (2014), and is an effort to stimulate and crystallise – through poetic means – shared reflection on the kinds of knowledge we contribute through our research in sport and physical activity. Through the lecture, David addresses questions such as: What kind of human/social science do we, as a diverse and often fragmented society, want – and perhaps need – in the 21st century? How might the kinds of research that support this be conducted in the particular contexts of sport and physical activity? How might the insights that arise be distilled and shared in ways that help individuals, strengthen communities and support societies to collectively negotiate the challenges of our times? 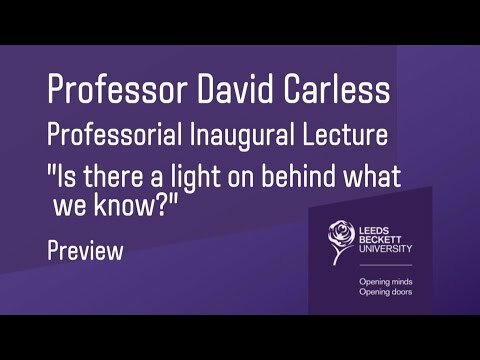 David Carless is a Professor of Narrative Psychology in the Research Institute for Sport, Physical Activity and Leisure at Leeds Beckett University. David’s professional journey began in 1990 when he enrolled on an undergraduate degree in Physical Education and, around the same time, started to perform as a singer-songwriter. After completing this degree, he spent several years teaching, travelling, performing and recording music, before moving to the United States in 1997 to study for a Master’s degree in kinesiology at Southern Illinois University. On completion of this degree, he was awarded a scholarship to study for a PhD in Exercise and Health Science at the University of Bristol. During his doctoral studies, two chance events occurred which shaped David’s subsequent research. First, he met and began working with Kitrina Douglas, another doctoral student at Bristol. Their enduring collaboration lies at the heart of David’s scholarship to this day. Second, whilst conducting his PhD research, David’s interactions with people who had recently suffered a heart attack led to professional and personal redirection. Sitting at these patients’ bedsides in cardiac wards – seeking their participation in a questionnaire-based study – David was privileged to witness powerful accounts of their life experiences. Often, the stories they shared portrayed personal transformations that challenged David’s assumptions about illness, health, relationships and ageing. Their stories also offered rich insights into his research questions – different kinds of insights than those recorded by questionnaires. A commitment to these kinds of personal testimonies triggered David’s embarkment on a qualitative research journey that he continues to this day. Fifteen years later, David is one of a number of researchers pioneering performative, storytelling and autoethnographic methodologies as creative ways to explore lived experience. These approaches have informed more than 50 journal articles, books and book chapters; several commissioned evaluations and research projects; numerous lectures and seminars; Continuing Professional Development (CPD) workshops; conference papers and keynotes; audio CDs and live performances. Through this work, David has contributed to methodological innovation, not only in sport and physical activity but also in interdisciplinary contexts which include education, counselling and psychotherapy, and health.